« Holiday Hero – Last Chance to Sign Up! 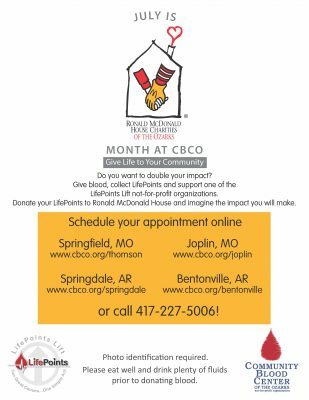 July 2018 is Ronald McDonald House Charities of the Ozarks month at Community Blood Center of the Ozarks! It’s a great way to help two non-profits at the same time — CBCO with your lifesaving gift of blood and Ronald McDonald House Charities of the Ozarks with your LifePoints which allows the organization to work toward its mission to create, find and support programs that directly improve the health and well-being of children in the Ozarks. Their first priority is to provide a “home away from home” for families when their seriously-ill or injured child is in a hospital far from home. Since 1988 the organization’s cornerstone project, the Ronald McDonald House®, has embraced more than 10,000 families during a time of unspeakable hardship. You’ll receive LifePoints for your donations all year round, and you can give your LifePoints to one of our agency partners at any time. Not just in July. But July is our time to share information about Ronald McDonald House Charities of the Ozarks. In addition to running a Ronald McDonald House for families of children who are ill to have a place to stay at Springfield’s Cox and Mercy hospitals, Ronald McDonald House Charities of the Ozarks operates The Ronald McDonald Care Mobile®, fondly known as the “Tooth Truck™“, which provides dental treatment and prevention education for at-risk children, primarily in school-based settings. A joint project between RMHC of the Ozarks and The Tooth Truck, Inc., the program has provided over 44,207 dental appointments for more than 18,268 children, in more than 13 years of operation, which is valued at over $10.4 million! In October 2011, the Tooth Truck successfully launched a pilot in-school tooth-brushing program at the Early Childhood Shining Stars Center of Springfield Public Schools. The program has now grown to include 380 students enrolled in the Early Childhood Program at five Springfield Public Schools. As the future unfolds, their vision will continue to include strong investigation of the communities they serve, with consideration of increasing ways they can help children become healthier and stronger, and to help their lights shine brighter. In a spirit of service, they are deeply committed to their roles as “thoughtful stewards” of Ronald McDonald House Charities® programs and resources. This level of commitment is their standard, and an ideal they all constantly strive for … as board members, professional staff, and volunteers. To learn more about Ronald McDonald House Charities of the Ozarks, click HERE. Founded in 1995, CBCO has grown to serve 39 counties in three states and is the sole supplier of blood and blood products to 41 hospitals in southwest Missouri, northwest Arkansas, and southeast Kansas (as of 7/1/18).